It was a thunderous sound that I heard and it came from outside my kitchen window. I jumped up to see what was the matter but I already knew. Mourning Doves were scattering throughout my backyard and flying off as far away as possible. Other birds too were flying off and only one lonely Cardinal sat there frozen in our river birch, not making a move or a sound. This is a familiar sight to see as it happens every so often in my backyard. Every time I hurriedly run to the window and look out in the yard and sky searching for it. It is the Cooper’s Hawk I am searching for who can easily whip through trees in a high speed flight to catch its next meal…the Mourning Dove. Really any bird will do as that is what it preys on. The Cooper’s Hawk is just one of the different Raptors or Birds of Prey that you will see out in the wild. 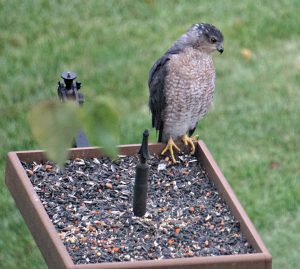 Cooper’s Hawk at my feeder. What is A Raptor…Bird of Prey? A bird of prey or raptor as it is known is a type of bird that hunts and feeds on rodents, other small animals, and birds. Raptors have very keen vision and have powerful talons that help them catch and hold their prey while tearing into their meal using their sharp cutting beaks. Birds of Prey are hunters and include hawks, eagles, owls, falcons, kites and ospreys. Vultures and condors are also in this category but they are more like scavengers and not really hunters as the others. Consequently, they are not included in this post. That’s another story ;-). There are at least seventeen different types of hawks found in North America. They are a more medium sized bird of prey and can vary in many different sizes. They can adapt to any surrounding but prefer an open area such as grasslands or fields. You may see them soaring hight above in these habitats searching for their next meal. The Red-tailed Hawk is the most common one but there are plenty more found throughout North America. They are The Broad-winged Hawk, Cooper’s Hawk as mentioned earlier, Ferruginous Hawk, Goshawk, Red-shouldered Hawk, Rough-legged Hawk, Sharp-shinned Hawk, Harrier, and the Swainson’s Hawk. Interesting Fact: Some hawks can obtain a speed of up to 150 miles per hour especially when diving for their prey. There are close to 60 different species of Eagles in the world with most of them found in Eurasia and Africa. There are two found in North America (Bald and Golden), and nine in Central and South America, and three in Australia. Eagles are one of the larger birds of prey. They have large eyes which can take up about 50% of their head and their vision is 4 to 5 times better than humans. So much better that they are able to detect their prey up to two miles away. Now that’s pretty good eyesight! Just like other birds of prey they have powerful legs, sharp talons, and beaks which enables them to capture and then tear into their food. An eagle’s diet depends on what is available to them. They are all carnivorous and eat meat and or fish. Interesting Fact: Eagles mate for life. There are about 268 species of owls in the world with 19 species in North America. 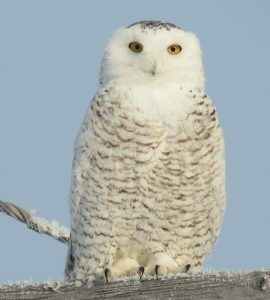 They are a solitary bird of prey and mostly all are nocturnal but some owls like the Burrowing Owl and Screech Owls have been seen active during the daytime. Owls can range in size anywhere from five inches tall (Elf Owl) to up to two feet tall (Great Gray Owl). Owls have specialized feathers which enable them to fly silently in the night time hours. That helps them come within inches of their prey without even being detected. Their eyes are large and forward facing and they have binocular vision that allows them to fully focus on their prey. Owls mostly feed on small mammals often swallowing them whole. Their dinner may be mice, rats, moles, squirrels, rabbits, and skunks but some also eat insects, worms, spiders, frogs, lizards, and small birds too. You will find owls located in various habitats ranging from backyards, mountains, forests, desert and the open grasslands. Interesting Fact: Owls can rotate their head to 270 degrees. There are about 40 different species of falcon and they are found in all continents of the world with the exception of Antarctica. They have thin, tapered wings, which enable them to fly at high speed and change direction rapidly making them the swiftest birds on the continent. 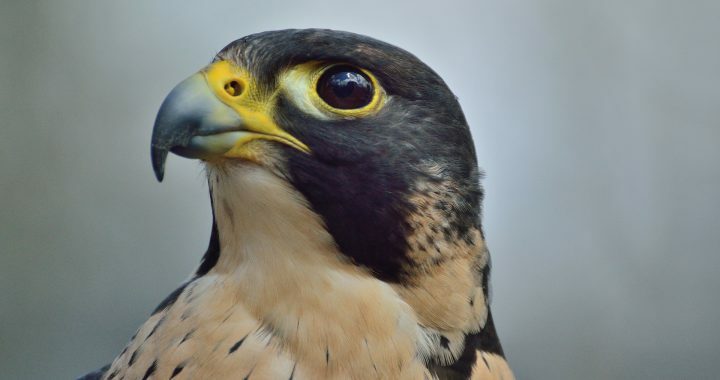 Peregrine and Prairie Falcons are native birds with the widest ranges in North America. The Merlin and American Kestrel are the smallest falcons found. Seventy seven percent to ninety nine percent of a falcon’s diet is other birds. The most common prey is the pigeon but they will also eat mourning doves, shorebirds, waterfowl, ptarmigan, grouse, and songbirds. 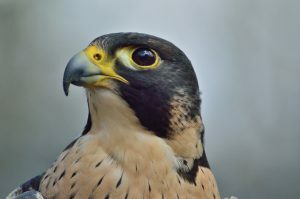 Falcons can be found in various habitats preferring wide open spaces such as near the coast where they can find shorebirds, in the city perched high up on buildings preying on pigeons, near grassy open fields, in the tundra, and in deserts. Interesting Fact: A peregrine falcon can dive up to 200 miles an hour to capture prey in flight, striking in midair with its outstretched talons, or claws. 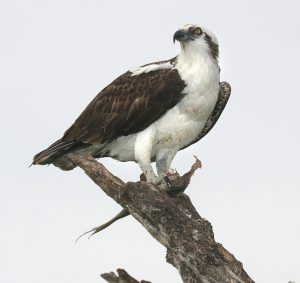 The Osprey is the only species in its family and can be found world wide. Some people may mistake it for a Bald Eagle if seen at a distance with its white head and black body, but if you look closely its head has a dark stripe that extends from the base of the beak and across the eye to the back of its neck. 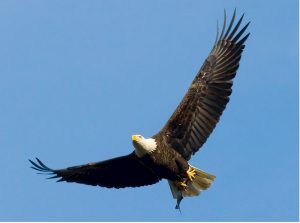 Plus a Bald Eagle’s wingspan is up to 91 inches versus the Osprey at up to 71 inches. Ospreys can be seen near coastlines, lakes, and rivers flying over the water hovering, and then plunging feet-first to catch fish in its talons. That is why they are also know as a fish hawk, fishing eagle, sea hawk, and river hawk. Ospreys are a large bird reaching 20 to 26 inches tall with a wingspan of 71 inches as an adult. 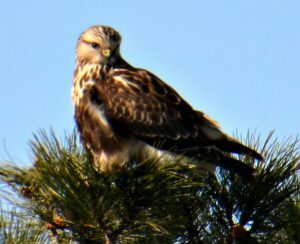 A Kite is lightly built, with a small head, partly bare face, short beak, and long narrow wings and tail. There are twenty two species of kites in the world with five found in North America in the southern regions. Swallow-tailed, White-tailed, Mississippi, Snail, and Hook-billed. Kites are a smaller bird of prey spending most of their time soaring. They feed on carrion, meat, frogs, lizards, snakes, and nestling birds. 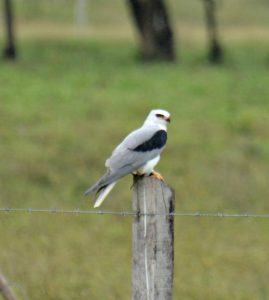 Interesting Fact: A White-tailed Kites courtship display is that of the male offering prey to the female. The female then flies up to meet the male, turns upside-down, and then grasps the prey. There are many birds of prey or raptors as they are know that can be found near you. Hawks, Eagles, Owls, Falcons, Osprey, and Kites all fall into this category. By paying attention to your surroundings you may see one of these spectacular birds doing what they do best, hunting for their prey. What an awesome sight to see too! Have you seen a Bird of Prey lately? You should if you are paying attention to the world around you. What have you seen in the last week? Let me know, I would love to hear your story! Please feel free to make a comment below! Interesting breakdown of all the different birds of prey. I never even knew some of them existed. And they are beautiful birds at that. I also like the fact that you have incorporated interesting facts about its bird type. Owls and the way they turn their heads creep me out every single time! Antonis, yeah many people do not know about a lot of these raptors. They think there is only one type but there are so many interesting species out there. Owls are my very favorite. I actually think it is pretty cool that they can turn their heads at 360 degrees. That is amazing! Thanks for your comments! I found your site when researching the in-flight drama I witnessed this morning. I often pause to enjoy the dawn chorus as I leave my house in early light. I do a decent Mourning Dove call and have conversed with one who took up residence nearby a few weeks ago. As I drank in the birdsong orchestra, a Mourning Dove darted close into view above my front steps, seemingly trying to select from the available nearby tree branches; it was about to alight on the one closest to me when, upon noticing me, hovered and veered away. Before it got 20 feet, a fast moving, brownish blur streaked in from my right, collided with the dove and continued as one indistinct body to land on the fronting sidewalk. After quickly getting a better grip on its prey, the raptor – not much bigger than the dove – carried it off and out of sight. I was spellbound by the unsorted emotions elicited by what I witnessed. 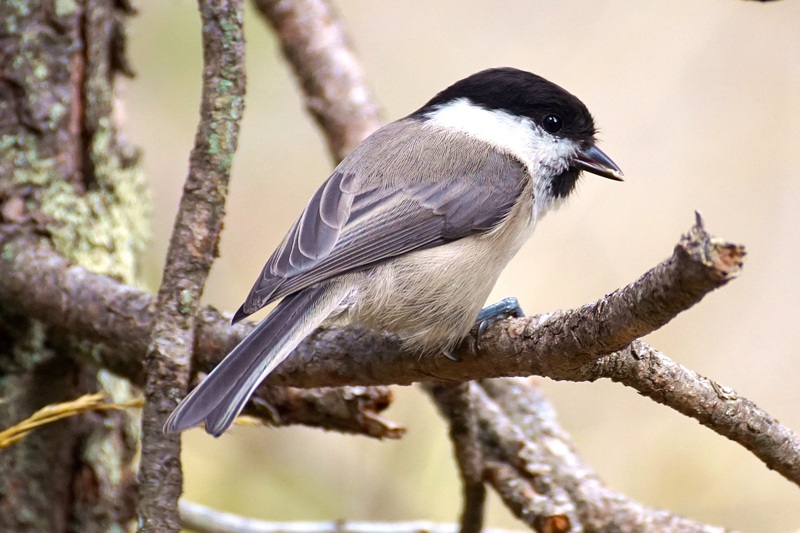 But eventually saddened at the realization that I may have been the last human to converse with that very individual in what is one of the sweetest birdsongs I hear. David, that is truly an amazing encounter with a hawk. It sounds just like what a Cooper’s Hawk would do. Their favorite meal is the mourning dove (with the sweet birdsong that I like too). Cooper’s Hawks move with such great speed to capture their prey and come from out of nowhere it is unbelievable. Unfortunately, that is nature at its best. I really do not care to watch it when it occurs but sometimes it happens right smack in front of you and you cannot avoid it.